Please welcome WSNA Nurse Representative Sara Frey, JD, BSN, RN. Beginning Thursday, Nov. 29, 2018, Sara will be taking over all new issues as they arise at Kindred Northgate. I will finish up most outstanding matters to their conclusion and assist Sara in the coming months as needed. Sara can be reached at sfrey@wsna.org or 206-575-7979, ext. 3039. It has been a pleasure working with all of the Kindred Northgate RNs for the past three years. I am continuing my work here at WSNA in public affairs. I will miss the Kindred Northgate nurses but know you will be in good hands with Sara. Announcing your new local unit officers! Ballots have been counted and your new local unit officers have been duly elected by the nurses. Take a moment to congratulate and thank them for representing you and for running your local unit. If you have questions about the contract or your working conditions, please contact WSNA Nurse Rep Travis Elmore at 206-575-7979 ext. 3117 or at telmore@wsna.org. Your new contract is online! The new WSNA/Kindred contract is now online! Visit the Contracts & Documents tab to review it. Our new contract outlines the new step system, wage increases and hospital staffing. View it for more details! If you would like a paper copy, please contact WSNA Nurse Representative Travis Elmore at 1(800) 231-8482, ext. 3117 or at telmore@wsna.org. On April 18, RNs voted on the Kindred Northgate contract proposal. The proposal has been ratified by the nurses. You can contact WSNA Nurse Representative Travis Elmore at 1 (800) 231-8482, ext. 3117 or telmore@wsna.org. Be there for your contract vote! Thanks to the hard work of the nurses, we have reached a Tentative Agreement on a contract! Your negotiation team recommends a yes vote! The vote will occur on April 18, 2018 in the Education Room! There will be two voting session: 6:30-8:30 a.m. and 6-8 p.m.
You must be a WSNA member in good standing to vote on the contract. Contact Nurse Rep Travis Elmore at 1 (800) 231-8482, ext. 3117 or telmore@wsna.org. In the coming days we will be reaching out to you to hear more about your thoughts and concerns and to discuss the current state of contract negotiations. Like our Facebook page for Kindred RNs! Your negotiation team is asking all RN’s to wear “I AM WSNA” pins on April 3 and 4 to show you stand in solidarity for a fair contract! WSNA RN members at Northgate have voted to reject the tentative agreement reached by the parties. In light of this vote, the contract will NOT go into effect. An emergency meeting of the WSNA RN membership at Northgate is scheduled for Feb. 13, 2018 from 6 - 8 p.m. in the Education Room. It is very important that you attend this meeting to discuss the next steps in the fight for a fair contract for the nurses at Northgate. Please continue to wear the pins, badge holders and use the WSNA pens to show your support for a fair contract! We have a tentative agreement on a contract! After months of negotiating, we can announce that we have reached a tentative agreement on a contract! Your bargaining team recommends this contract for ratification. Upon ratification of the new agreement, Kindred will implement a new wage scale with a base wage of $29.00 (current is $28.21) and a top Step 31 of $55.43 (current is $54.67). The new scale will guarantee a 2% step adjustment every year until you reach Step 31. Upon ratification, nurses will move to the step that is above and closest to your current wage. The bargaining team fought long and hard to win the best possible wage increases. While the raises negotiated into this contract leave Northgate nurses behind the wage market, the bargaining team believes that the increases represent the best possible outcome in light of the hospital’s current economic circumstances. Nurses will receive these raises on your anniversary when you move receive your Step increase. The hospital has agreed to recognize the important voice of Northgate RNs in determining the appropriate staffing at the hospital. As a result, the hospital in compliance with Washington state law, will form a Staffing Committee comprised of 50 percent WSNA nurses to determine the appropriate staffing plan for the hospital and to resolve the complaint of any nurse regarding hospital staffing. Nurses who serve on the Staffing Committee will do so on paid work time. The hospital will not counsel, discipline or discriminate against any nurse who makes a complaint to the Staffing Committee regarding hospital staffing. Increase of Temporary Assignment Premium from $2.50/hour to $2.60/hour. Improvement in discipline language – Disciplines cannot be used against an employee after 12 months of no reoccurrence and final warnings cannot be used against an employee after 24 months of no reoccurrence. 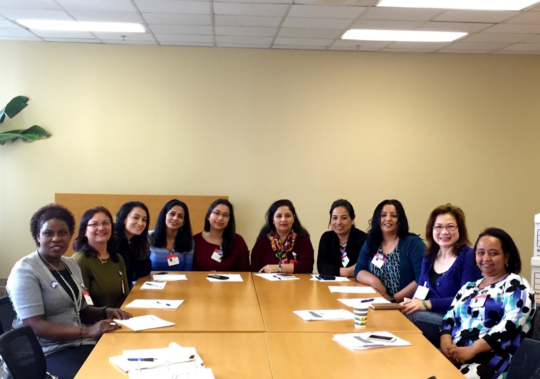 Language to help Northgate nurses strengthen your union at Northgate – Dedicated time for new employee orientation and updated language regarding the roster information provided by the hospital to the union. Language allowing your WSNS nurse representative to attend meetings of the Conference Committee. The hospital may present employees with gifts (e.g. Holiday Turkeys, years of service awards) without creating a binding past practice. The hospital may offer bonuses to employees so long as the bonuses are fair and equitable and the hospital does not engage in favoritism. The employee handbook will be incorporated into the contract. A nurse who is low censused out of turn will move to the end of the low census rotation. The hospital attempted to eliminate overtime for work after an employee’s shift. The hospital attempted to reduce the number of paid holidays from eight (8) to six (6). The hospital attempted to remove pay in lieu of benefits from the last two (2) employees who remain eligible for this benefit. Your bargaining team listened to your concerns and interests. We worked hard to represent your needs to the hospital at the bargaining table. We recommend that members vote to ratify this contract and we hope that you will join us as we organize ourselves to work with the new ownership of the hospital to make Northgate Hospital a healthcare facility that best meets the needs of our patients, our community and ourselves. The vote will occur on Jan. 30, 2018 in the Education Room. Thank you for your support during these difficult negotiations! Like us on Facebook to stay updated. On Jan. 10 from 5:30-7:30 p.m., we will be having a meeting with the union members at Kindred Northgate. We want to speak with you about the current state of negotiations and next steps in the contract negotiation process. Please plan to attend! Travis Elmore, WSNA Nurse Representative can be reached at 1-800-231-8482, ext. 3117 or telmore@wsna.org. On Oct. 12, your negotiation team met with the hospital and a federal mediator. Kindred sent their attorney and a human resources representative to negotiate. Kindred sent no nurses to the negotiation table. Your negotiation team presented a reasonable economic proposal to Kindred, unfortunately Kindred refused to come our way. We have begun to plan “actions” to show Kindred that the RNs deserve a fair contract. Stay Tuned! Thank you to everyone who came to the union meeting and wrote a statement on our Solidarity Signs in the Education Room! Your signs were displayed in the negotiation room and Kindred read them. Our next negotiation date is set for Nov. 30 with a federal mediator! If you haven’t already, please “Like” our Facebook page created for Kindred RNs. Your WSNA Negotiating Team members: Kim Toy, Kanna Teferi, Pia Almajano, Francine Liu and Greg Roebuck. Travis Elmore, your WSNA Nurse Representative, can be reached at 1 (800) 231-8482, ext. 3117 or at telmore@wsna.org. On September 13, your negotiation team met with the hospital for the fourth time. Kindred chose to only send their attorney to negotiate; however, some progress was made. Thanks to the words of Greg, Francine and Kim, the hospital withdrew their proposal to take away overtime. Your negotiation team continues to advocate for your priorities! There will be a union meeting on Oct. 4 from 1730-1900 in the Education Room! Our next negotiation date is set for October 12 with a Federal Mediator! Please continue to wear the pins and badge holders and use the WSNA pens to show your support for a fair contract! 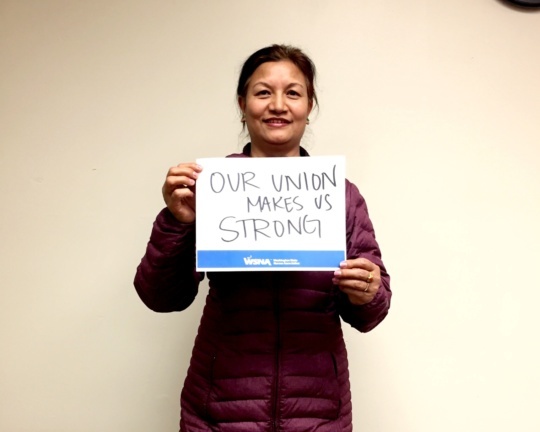 In Solidarity, Your WSNA Negotiating Team Members: Kim Toy, Kanna Teferi, Francine Liu and Greg Roebuck. On August 23, 2017 your negotiation team met with Kindred for the third time. Kindred chose to only send their attorney to negotiate and we made no progress. Kindred’s wage proposal continues to be: 0.5% in August 2017, 0.5% in February 2018, 0.5% in August 2018, 0.5% in February 2019, 0.5% in August 2019 and 0.25% in February 2020. Kindred’s wage proposal does nothing to address the rapid RN turnover at the hospital. Kindred continues to propose significant take-aways from the RNs! Kindred wants to take way your overtime for any time that you work beyond your shift. Kindred also wants to take away 2 of your 8 paid holidays. These proposed take aways are wrong and do not move Kindred Northgate toward being a workplace that provides the best patient care and attracts and retains phenomenal RNs! The current WSNA/Kindred contract expires August 24, 2017. However, WSNA and Kindred have agreed to extend the current contract for a few more weeks. Our next meeting is set for September 13th! Please continue to wear the pins, badge holders, and use the WSNA pens to show your support for a fair contract!! !